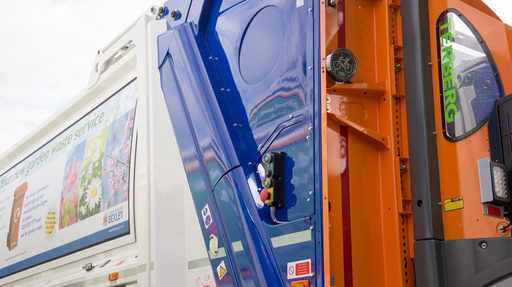 Serco is equipping its entire fleet of waste and recycling vehicles across London with cutting edge cyclist safety technology in support of the Safer London Lorry Scheme, which comes into force on 1 September. There have been 8 cyclist deaths in the Capital this year and 7 of those involved collisions with HGV’s. One of the world’s leading public service providers, Serco, operates over 117 Heavy Goods Vehicles (HGVs) in the form of Refuse Collection Vehicles (RCV’s) inside the M25 on behalf of Bexley, Wandsworth, Hammersmith & Fulham, Havering and Newham boroughs. In Spring 2014, the company announced its decision to adopt the Cyclear cyclist warning display system after successfully trialling the system in Wandsworth, and then installing the equipment to 23 RCVs in the London Borough of Havering. Cyclear was developed in the UK by vehicle safety technology company Innovative Safety Systems Ltd (ISS) and comprises an illuminated sign and speaker to alert cyclists and vulnerable road users when the vehicle is turning left. The system has an optional sequencing sensor feature, which notifies drivers when a cyclist or pedestrian is approaching. One of Serco’s Havering fleet was recently showcased at the City of London Cycle Awareness Day held at Guildhall. As well as Cyclear, ISS designs, supplies, installs and maintains the full range of safety and lighting products including reversing radars, CCTV camera systems, Hard Disk Recording, warning beacons and LED lighting packages.